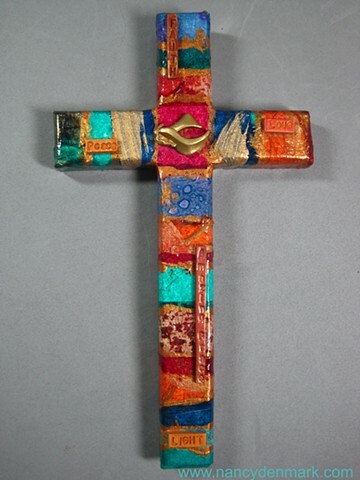 "Tapestry" cross with peace dove symbol and words of Faith, Peace, Love, Amazing Grace, and Light. "Messenger of Peace" dove symbol. The story of Noah and the flood reads,"
the dove came back to him, and lo, in her mouth a freshly plucked olive leaf; so Noah knew that the waters had subsided." Genesis 8:11 With this sign of hope, new life would follow.